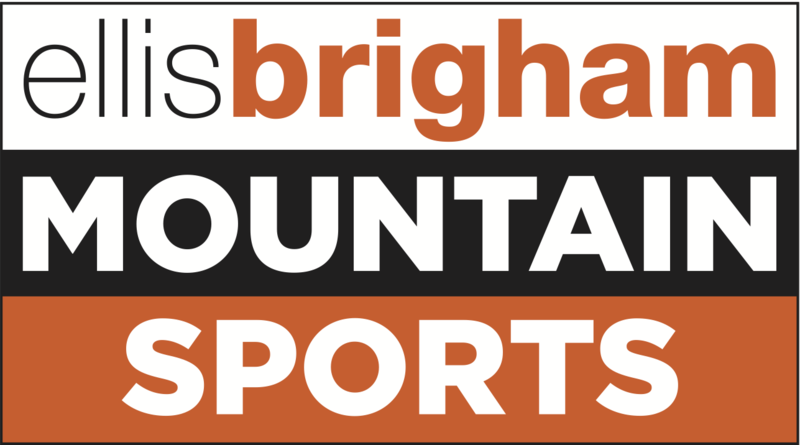 It’s difficult to draw much of a coherent blog post out of the last couple of months as they’ve been full of travel, work and climbing. My poor Citroen C1 has been running me to opposite ends of the country on regular intervals but still seems to be going strong despite the length of time it has spent on the M6. I’ve been working in Inverness for quite a few weeks this year and in the evenings have been getting out and experiencing some of the local climbing for the first time. 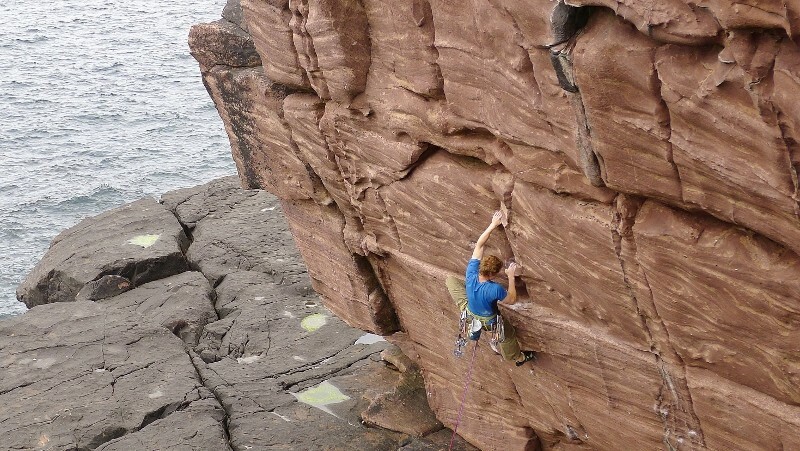 ‘Local’ is a term I’d use quite loosely as you do need to drive about 30 minutes to get to the nearest crag and over an hour for many of the better venues but there is some great climbing to be found with the likes of the Camel, Moy and Duntelchaig being a relatively short drive after work. It’s not exactly North Wales convenience climbing, but good if you’re still motivated to get out after work. The best of the bunch is Creag Dubh near Newtonmore. This crag is unhelpfully referred to as Creag Death by many of the locals which seems to scare most climbers away despite the quality of climbing there. Creag Dubh has to be one of Scotland’s best roadside crags; it has fantastic climbing and doesn’t seem to be too bold despite its reputation. You have got to be keen to climb at Creag Dubh when you finish work at 5 in Inverness but it always feels worthwhile in retrospect. Sam was looking fairly sceptical on our first visit as I promised him the rain would stop by the time we got to Newtonmore and he must have been cursing my optimism as we walked up to the crag in the drizzle but miraculously the Sprawl Wall was just about steep enough to stay dry in the rain. I started up Cubby’s tricky E7 wall climb ‘Yes Yes’ in a light drizzle, convinced it would soon stop raining, and by the time I’d clipped the bendy peg having done the crux it started to absolutely chuck it down – enough for my chalk bag to start filling with water! 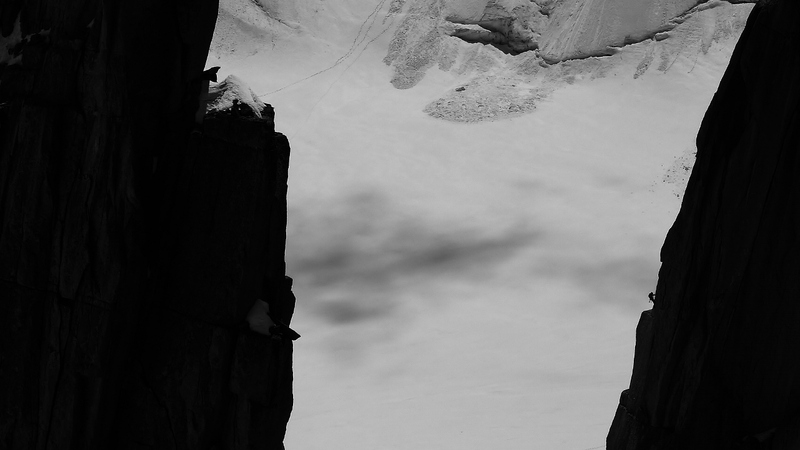 With a final long 5c move to the ledge I was unsure whether I would be able to top out into what was now a mini waterfall and rather than risk falling onto the tatty peg I decided to run away and descend in more control. 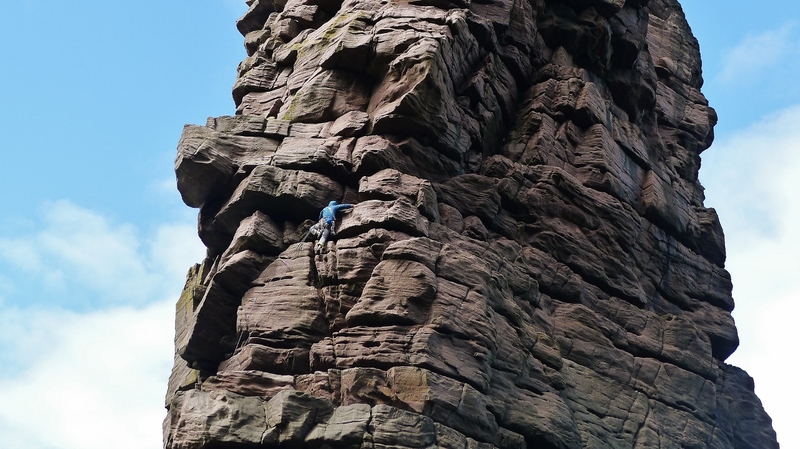 I returned a couple of days later with Ross to finish it off in much better conditions and we followed this up with an ascent of ‘The Meejies’ which is by far the hardest E5 I’ve climbed in Scotland and nearly as tough as ‘Yes Yes’! One of the highpoints of working up there was also taking my army group up the Old Man of Stoer. It can be surprisingly unusual to get a highly motivated group of squaddies on foundation courses, sometimes it feels like you’re going through the motions a bit with teaching but when you do get a good group for ten days you can achieve some really memorable things. 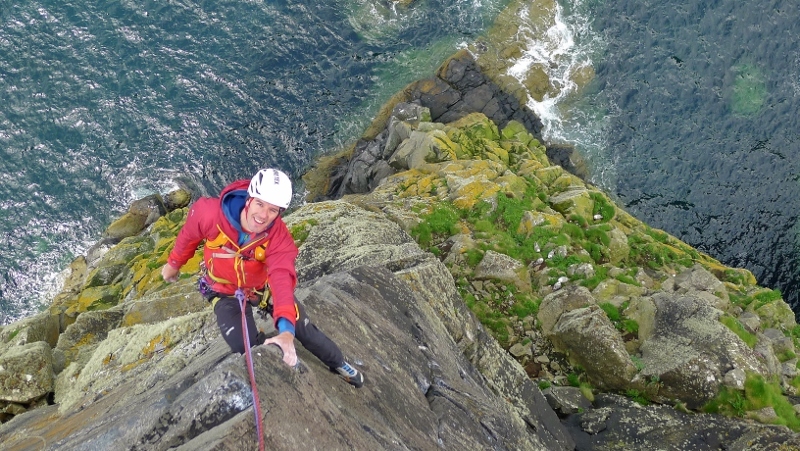 None of the five guys had done much more than an abseil before coming on the course and to finish off with all five getting up the Old Man of Stoer was a fantastic achievement – especially considering it was a fairly cold day. More recently I also enjoyed a nice short holiday in Scotland with Gabby around Skye and Glencoe. It was Gabby’s first time in both areas and despite low expectations with the weather we had a really good time scrambling around the Cuillin and climbing on the Etive Slabs. I managed to make what was probably the second ascent of Dave Macleod’s ‘The Gathering’ on the spectacular Cioch in Coire Laggan. 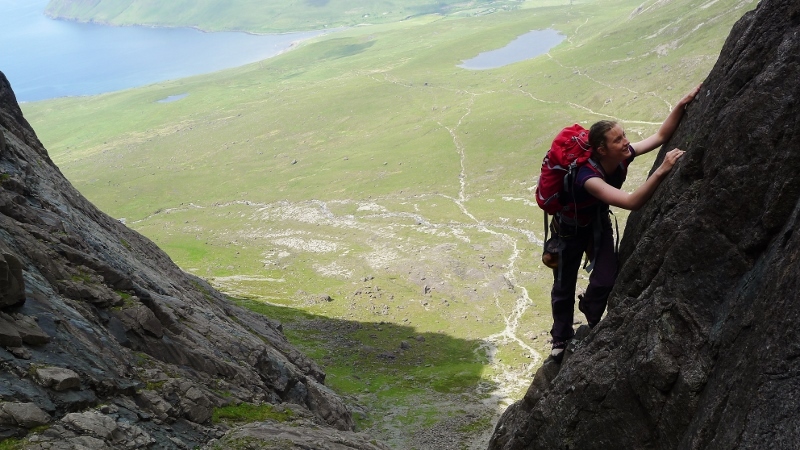 This spectacular route is an out and out classic, perhaps more E7 than E8 but with delicate, technical and exposed climbing. The Gabbro is unbelievably rough though and with the high humidity that day I was lucky to have enough skin left on my fingers to repeat the route before we continued up Sgurr Alasdair and along the ridge itself. 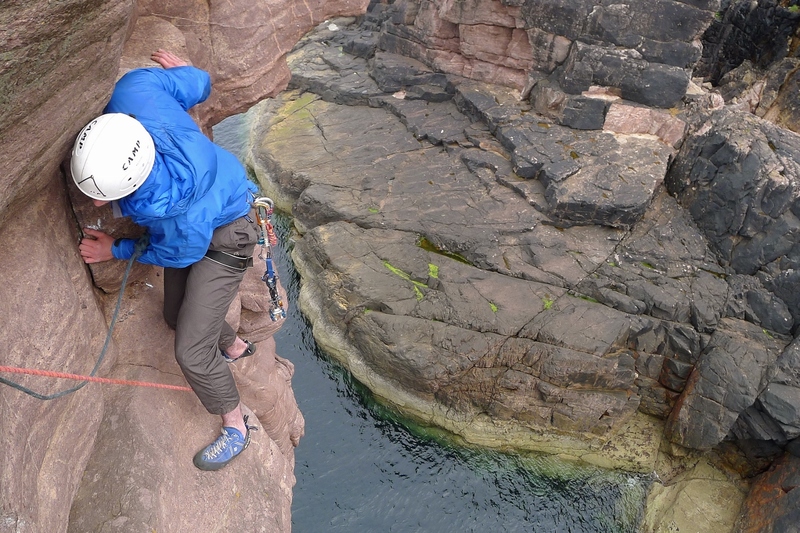 I also caught up with Dave Macleod and we spent one afternoon repeating the decidedly bold ‘Death Pirate’ E6/7 6b at Neist Point in cold and windy weather. 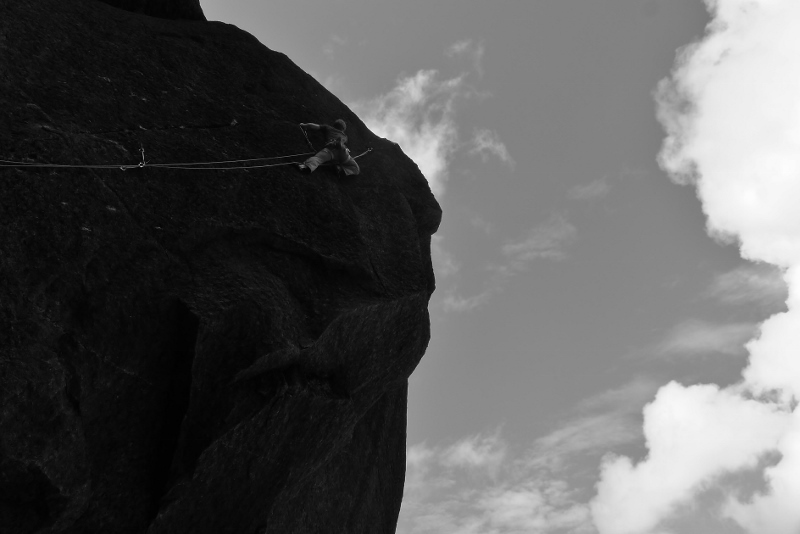 An amazing arête which was only disappointing due to me dropping a rock shoe 100m into the Atlantic from the top. 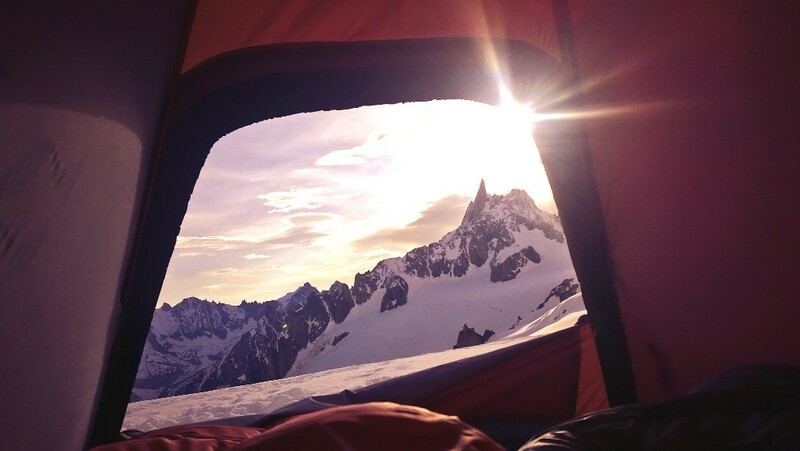 In June I headed to the Alps with Emma Twyford on a Rab photoshoot. 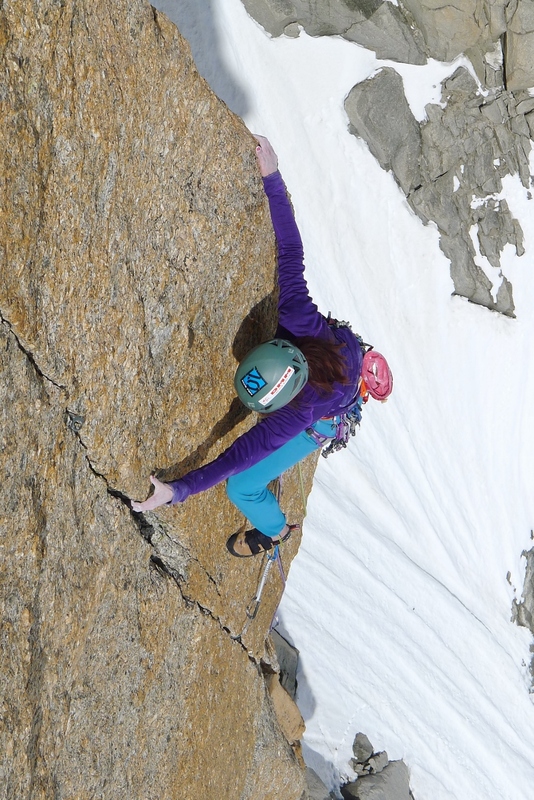 Emma took to the granite climbing surprisingly well and after her first day was already looking strong on the technical routes around the Cosmiques Arete. 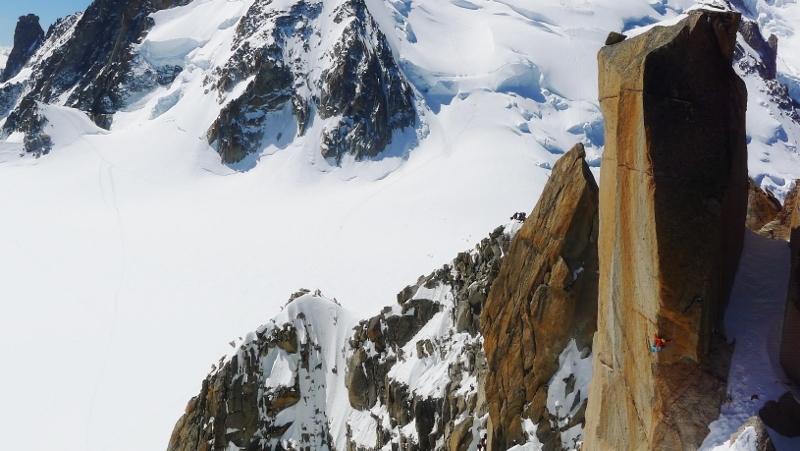 Our aim had been to attempt the ‘Voie Petit’ but this turned out to be logistically challenging proposition with a camera crew and not too much time, so after climbing up to the crux pitch we changed plans and the ‘Voie Petit’ will have to wait for another year. Back home I’ve been enjoying some time off and trying to make the most of any opportunities to get out climbing. 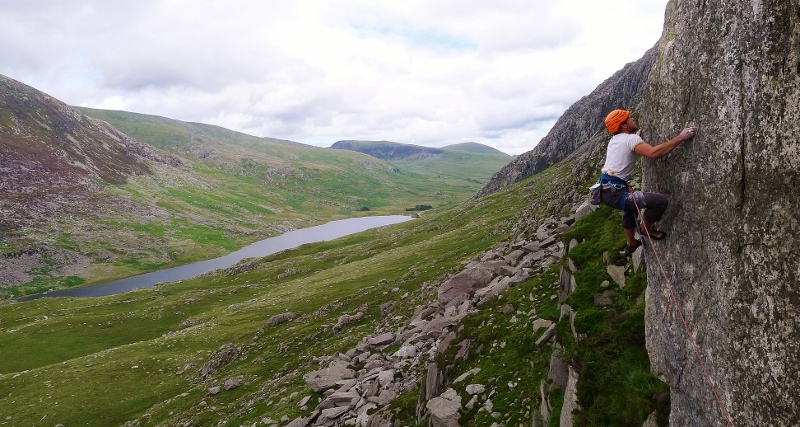 I’ve been climbing some of the more esoteric routes that North Wales has to offer and also climbed a couple of new routes. 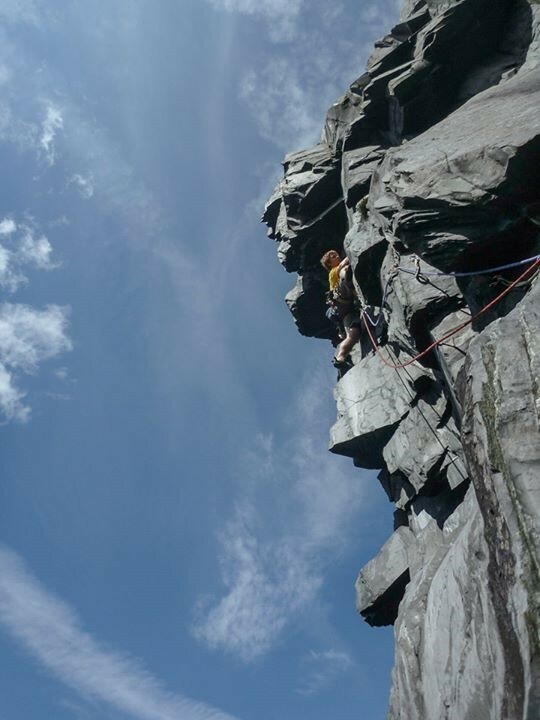 The first of which was a three pitch new route on the slate which I first attempted with Mark Dicken and Steve Long. 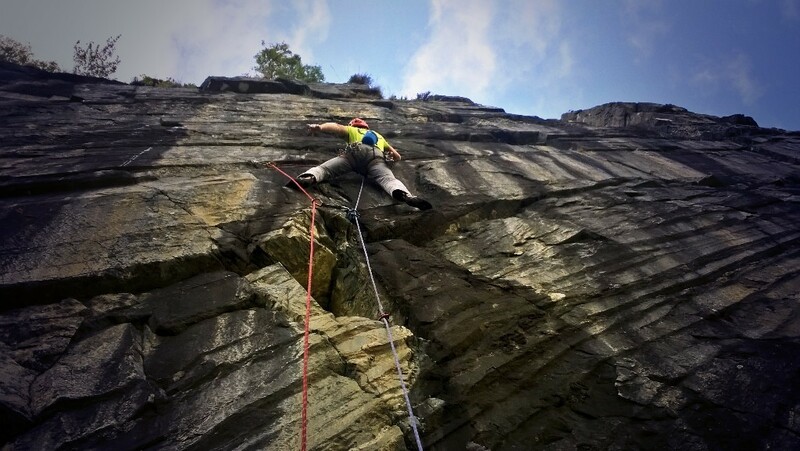 The first couple of pitches are adventurous but ‘so so’ in quality with climbing up to about E4. The final pitch looked deceptively easy through a roof with good holds. As is often the way with on-sight new routing I had a hard time on this easy looking pitch! I committed to a gently leaning groove that turned out to be off-balance, tricky and very run-out, to get to a good rest before the roof. Above I could reach some good holds and see a good wire placement but placing the gear was extremely difficult and after a while I decided to leave the route for a cooler day. Returning the following evening with Gabby, I abseiled down the pitch to see what size of wire would fit the slot and climbed it next go at E7 6b. It’s called ‘Burning Bush’ and around 7a+/b in a wild position at the top of Twll Mawr. Finally I also got round to climbing a new route/link up on Clogwyn y Tarw that I’d noticed ages ago. This links the start of an E2 called ‘Trouble with Lichen’ into the top arête of ‘Rare Lichen’ to produce a nice soft touch E8 link without the bold crux of Rare Lichen. The gear is pretty good and the new section of climbing is relatively easy but does have a nice ramp leading to the brilliant upper arête. I think it should be a relatively popular route for the grade as it’s fast drying, safe(ish) and has a short approach – time will tell! It’s called ‘Day of the Triffids’ in keeping with the John Wyndham book ‘Trouble with Lichen’ that it starts up.